Spring is the season of rebirth, renewal and regeneration and April is certainly bringing in the feeling of rebirth to our lives- sometimes moment to moment! These are formidable energies we are dealing with right now. The waters of life may feel choppy. You may be feeling unsettled, tempted to indulge erratic behaviours, be bombarded by feelings of ‘rush!’ and ‘change!’….you may be wondering: WHAT IS HAPPENING?! This is a challenging time but it’s ok. It’s just a cycle. It has come and it will go. You are not going crazy, you are not imagining it, you are not moving backwards and you are not alone!! let your (maybe myriad of!) feelings out- sing, dance, write, shout, scream, laugh- whatever you need to do, do it. This week may not be a great one for sharing your stories with others, it could perhaps be wiser to deal with your emotional world alone! Be kind and patient with yourself- and with everyone around you! Do whatever works for you to get to a point of stillness and allow yourself to float there. Connecting with the still-point of your mind will make this week a lot easier to deal with- especially when you have to deal with others who are all going through the same thing! So yes, this is an intense time. But it doesn’t have to be upsetting or overwhelming. Instead, we can choose to be serene in the midst of the hurricane moving around us. We can choose to have faith in the foundations we have built over the last few years, to have faith that our path is set before us and when the winds calm down it will be revealed. We can choose to not allow doubt to take control and to instead, be in flow. We can grasp many layers of meaning within this one simple and profound quote, depending on our perspective (and/or attitude!). But the inspiration I suggest we take from it and keep in mind this week is: we each have the opportunity to start afresh each day. We can utilise this opportunity and act as the person we know we truly are, no matter what has come before. We can reinvent, regenerate and renew our being, no matter our history. We are in an intense cycle that could push us to behave erratically but we are not helpless. We can choose to be patient with ourselves and others, to stay out of drama and conflict with our own feelings and with others, we can choose to be loving and kind to ourselves and to others. 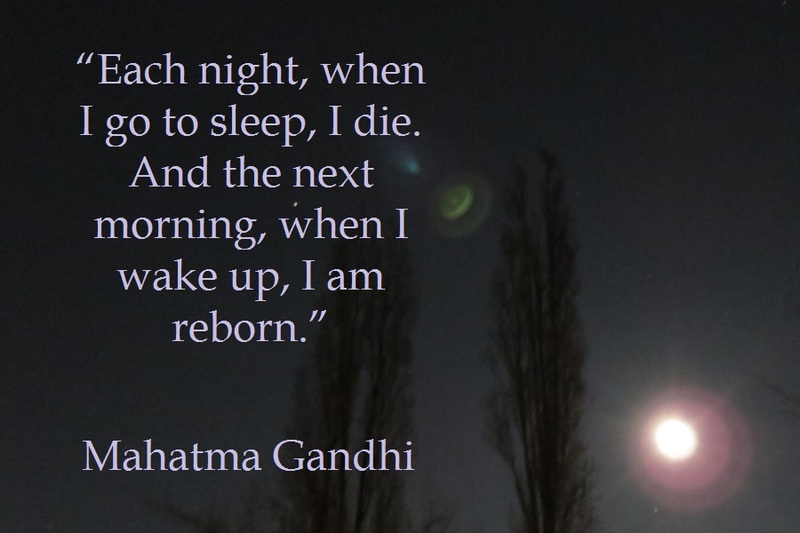 We can choose to view each day as an opportunity to be reborn! This entry was posted on April 9, 2015 by laura kilty in Thoughts and tagged A Time For Everything, April, Breathe, change, Intense, Intense energies, Karl Ove Knausgard, Mahatma Gandhi, Patience, Push, Rebirth, Renewal, Resurrection, Shift, Spring, Swami Satchidananda, The Yoga Sutras.